just as much as any other life form." 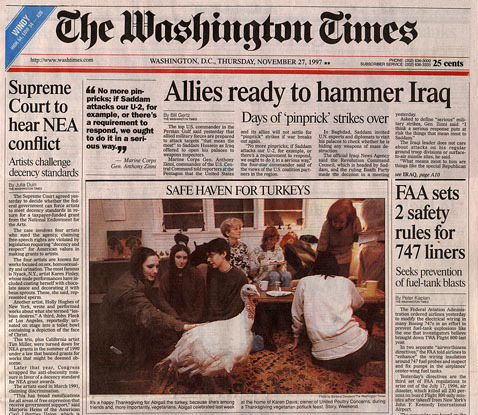 United Poultry Concerns was honored with a feature on the front page of The Washington Times on Thanksgiving Day this year (Nov. 27, 1997). 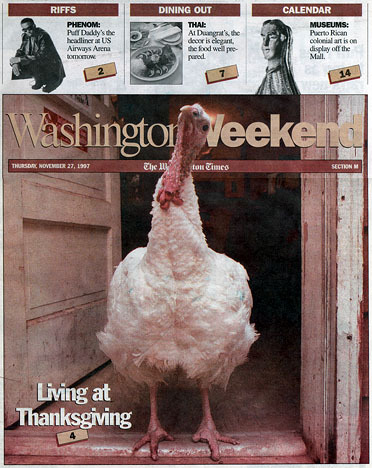 The following is an excerpt from Living at Thanksgiving, the cover story in The Washington Times Washington Weekend by Bradley R. Marshall about United Poultry Concerns. "Thanksgiving. The word conjures up many images, including a turkey on the table at home. "Not to Karen Davis, president of United Poultry Concerns (UP), a domestic fowl sanctuary in Germantown. The group's 'All-Vegetarian Gourmet Potluck Feast' the Saturday before Thanksgiving serves up a wheat-based simulation of the traditional bird (the 'Great Gluten Turkey,' Ms. Davis calls it) for some 250 local vegetarians and animal lovers--as the living birds look on. 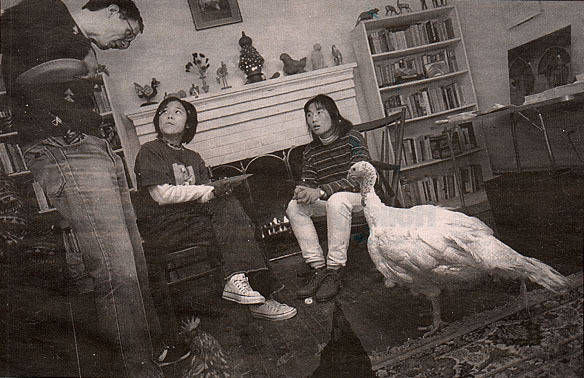 "'Chickens and turkeys are earthy, enchanting creatures, interested in everything they're doing. To me, they are the epitome of the vulnerable life that we all share,' Ms. Davis says as she describes UPC's departure from Thanksgiving's meaty tradition. "United Poultry Concerns, incorporated in Maryland in 1990, is a nationwide organization, with more than 7,000 members in all 50 states, Canada and Mexico. Its pre-Thanksgiving feast is not the only one in the Washington area . . . but it is the only animal sanctuary in the United States that harbors domestic fowl exclusively. "A visit to Ms. Davis' sanctuary, on a winding, semi-dirt, pock-marked road, makes it clear that to her, all fowls are fair. . . . She opens the door to the coop and the birds come out fluttering, crowing and cackling--to bathe in the sun and rollick in the dust. "She . . . points to a proud hen named Minna. 'They're great animals. Some of their most appealing characteristics are that they're homey birds, yet very zesty and independent. They respond to their names--but it doesn't mean they're going to come running when you call them!' . . .
"Ms. Davis has written several books, including a children's book ('A Home For Henny') and a cookbook ('Instead of Chicken, Instead of Turkey'). Her most recent work . . . may be the most important. 'Prisoned Chickens, Poisoned Eggs: An Inside Look at the Modern Poultry Industry' (Book Publishing Company of Summertown, Tenn.) takes an uncompromising look at factory animal production. "She pursues her goals single-mindedly, but it's not as if she's working alone. Even today, she's joined at the farm by UPC member Lynn Halpern and Ms. Halpern's adopted turkey, Abigail, one more bird saved from a truck spill. . . .
"It's hard to know how long this can go on. Only a short drive past Ms. Davis' house, suburbia encroaches. . . .
"'It's just a matter of time until it's re-zoned from agricultural to residential,' she says with a sigh. 'But we're looking for a piece of land within 75 miles of D.C. for our tax-deductible organization. We need a chicken sanctuary, including the crowing of roosters, where I can continue to do my educational work. We'd like to be able to expand our sanctuary and accommodate about 150 chickens.'" United Poultry Concerns wishes most gratefully to thank the writer of the article, Bradley R. Marshall; Washington Weekend Editor of The Washington Times, Cathryn Donohoe; and Washington Times photographer, Barbara Davidson, for this wonderful story.